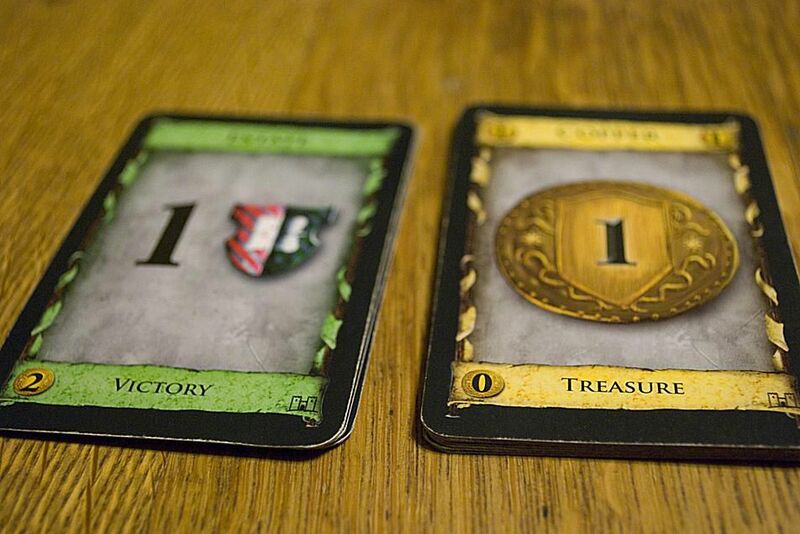 ​Dominion is a deck-building game where you buy cards—action, treasure, and victory cards— to put in your deck. And while treasure and victory cards may be important, the meat of the game is all about the different action cards you can buy. Learn about the pitfalls with actions cards and a few basic strategy tips to help you figure out what actions you should buy. The most common mistake in that people make in their first games of Dominion is that newbies end up holding too many actions cards. Since you only get to play one action per turn, a hand full of unusable actions does you no good. Too many actions will ruin your deck. An easy action card pitfall looks a lot like this: The first turn you pick up a Workshop because a free card every turn sounds cool. Then you buy a Smithy because drawing cards is always good. Then you workshop the second Smithy and purchase a Cellar, and a Militia, and a Woodcutter, and before you know it, your deck is filled with actions. Unfortunately, in most cases, a deck full of actions does not work as well as you would like. Chances are, your hand is full of a few action cards, of which you can only play one. Making matters worse, in spite of all the awesome cards in your deck, you never seem to be able to afford the very expensive stuff. Try to add just enough actions to your deck that leaves you with one action per every five cards. Ideally, you would draw exactly one action card every single turn. As mentioned above, if you draw many action cards, all but one of them is wasted. Conversely, if you do not draw any actions, then your one free action is going to waste. The point is to play your one action every turn without having any dead cards in your hand. So, by the time your deck hits 20 cards, four actions is not a bad number to aim for. An important thing to keep in mind is that the above ratio only applies to terminal actions. A terminal action is an action card that does not give you "+actions." Cards like Market or Cellar give +1 action, which means that after you play them, you can still play another action. These non-terminal actions should not be counted against your one-to-five ratio. In other words, a good 20-card deck could have a Cellar in addition to four terminal actions like Militia or Workshop. Actions that offer +1 action and +1 card are often referred to as "cycling" because they help you cycle through your deck faster. Such cards, regardless of what else they do, take up no space in your hand or deck. After you play one, you gain an action to replace the one you spent playing it, and you draw a new card to replace it. Cycling cards may not always be the best purchase, but you can rely on them not to hurt your deck. In fact, if your deck consisted only of cycling cards, you would get to play your entire deck every turn. There is one case in which the above two points do not hold. Drawing action cards you can no longer play is referred to as a "dead draw". If you play a card like Smithy with your one action and draw three new action cards, you have no actions left to play them even if they would normally cycle. So, to avoid this from happening, you need to evaluate your deck. If your deck has a number of terminal card-drawing actions, you should either avoid buying too many cycling cards or consider some action multipliers. In the base game of Dominion, there are two action multipliers: Village and Festival. Each of these cards gives +2 actions, not only replacing the action needed to play them but giving you an extra one as well, allowing you to play two more actions on that turn. This allows you to play a card like Smithy to draw more cards, and then play one of the actions you drew. A deck that combines multiplied actions with strong card-drawing like Smithy can be very powerful. However, keep in mind that all purchases have an opportunity cost. The village is an inexpensive cycling action multiplier, making it an attractive card to smooth out any deck. But buying two Villages at the beginning of the game does not improve your deck at all while buying two Silver for the same price will rapidly increase your buying power.